I’m loving the colour Smoky Slate at the moment. 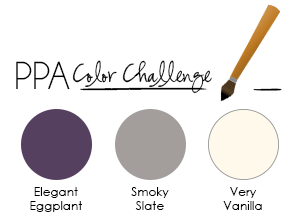 The design team at Pals Paper Arts have a challenge with Smoky Slate and Elegant Eggplant in it, so I knew I had to play along. I’m entering my card into Mojo Monday’s sketch challenge as I have used their layout for my card. Don’t you just love this sketch? The stamp sets I’ve used are Stampin’ Up! 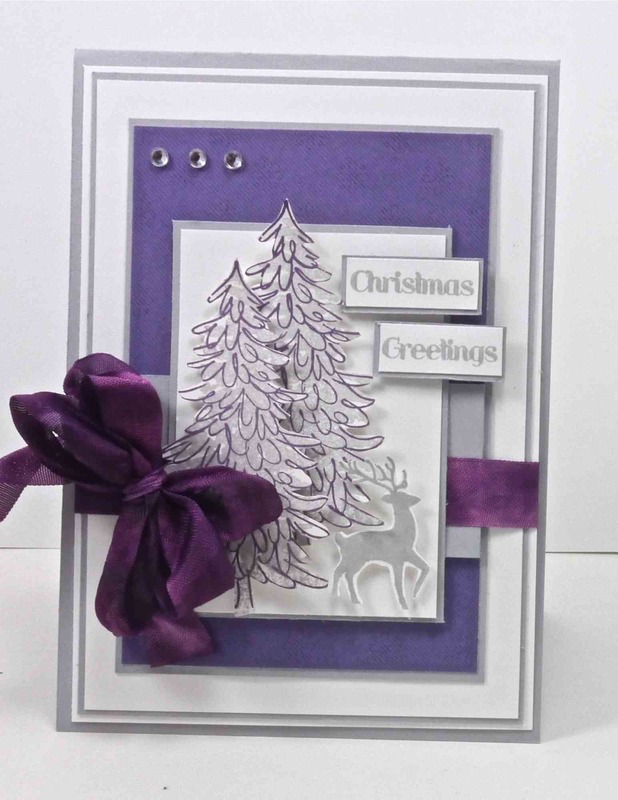 ones Evergreen and the cute little reindeer and sentiment are from a Hostess Stamp set called Warmth & Wonder. I’ve almost run out of all my Elegant Eggplant DSP in my stack so I found some offcuts from a long ago retired pack called Lap of Luxury. You’ll probably notice that I’ve used Whisper White instead of Very Vanilla? Well that’s because I didn’t study the challenge colours before I whipped up my card – sorry ’bout that! My bow doesn’t quite look like Elegant Eggplant, but it is. I don’t have an Elegant Eggplant re-inker so I had to run the seam binding over the ink pad with my fingers and by the time it dried, it came out with slightly pinkier tones. Love your take on these challenges. But I’ve got to wonder what color your fingers were once you were done inking the ribbon? I love your card–it’s lovely! Thank you for joining the Pals this week! This is my kind of card! Love it!! !